Christen Press has stepped out of her comfort zone and into a new role with the U.S. women's national team. Sunshine and short sleeves still the rule, it is easy to be optimistic in San Diego in January. Even by those standards, Christen Press radiated good vibes during the days between the end of the U.S. women's national team's training camp and the first game of a new year. "I think it's going to be a good year," Press beamed at the time. "I feel it." Events may yet prove her prophetic. This may be a defining year for Press, who recently made her 100th appearance for the national team and turns 30 at the end of December. 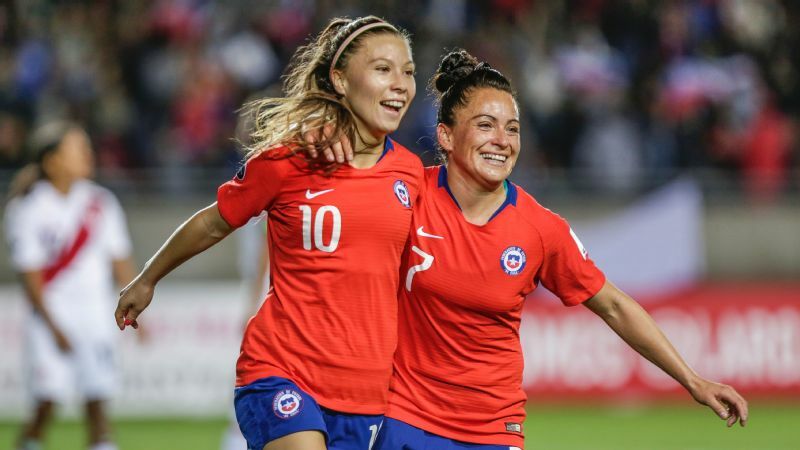 Defining not just in adapting to a role with the national team that could lock up a place on next year's World Cup roster, but in discovering the sort of peace of mind that will lead her through the remainder of her career for club and country. It would be a good year, indeed, if all of that came to pass. 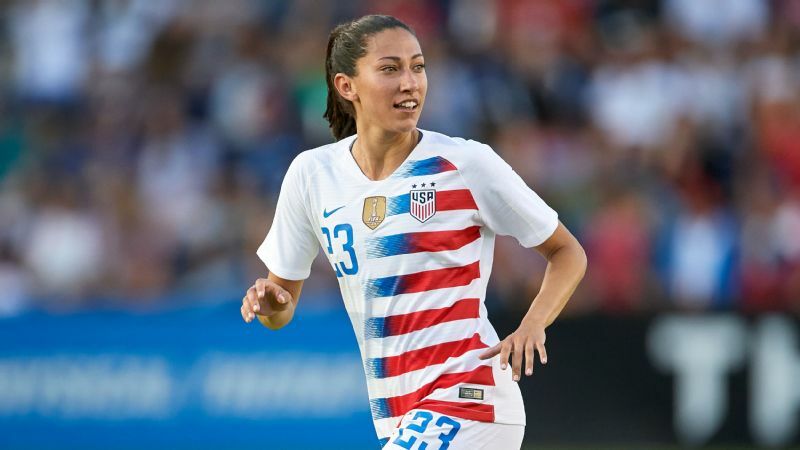 Christen Press, who turns 30 in December, recently made her 100th appearance with the USWNT and has 44 international goals. As she would be the first to admit, that still wouldn't make her a soothsayer. The year now unfolding as Press returns to California with the U.S. team, first near her hometown in the Los Angeles area and then near the Stanford product's college stomping grounds in the Bay Area, looks nothing like the year she envisioned. It has been a year of disruption, four pro teams spread across two continents claiming rights to her services at various times. It has been a year of retracing her steps while also stepping out of her comfort zone. And a year best summed up by one of international soccer's unofficial all-time leaders in existential musings, a deep thinker and equally careful planner, reaching a surprisingly simple realization about her journey. "I'm very much a person that intellectualizes everything," Press said more recently. "So with football I've started to let go of that and stop psychoanalyzing everything and start just feeling and being -- because playing football actually feels really good. It's really fun." Or as summed up by words attributed to the noted philosopher Theodor Geisel, Dr. Seuss, sometimes the questions are complicated and the answers are simple. Even as she expressed her unbounded optimism in January, Press wasn't sure what uniform she would wear in her next professional game. She had days earlier been traded from Chicago to Houston in the National Women's Soccer League, ending a 3½-year run with the only team she had played for since returning from a stint in Sweden that she often credited with reigniting a passion for the game dulled by domestic pressures and expectations. Except as everyone now knows, Press never made it to Houston. She instead ended up on a plane back to Sweden and her former club in Gothenburg. 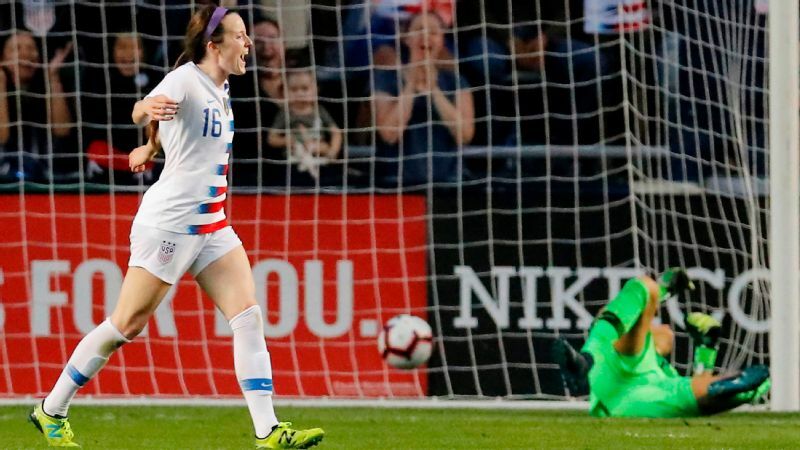 It was a move that puzzled many the year before a World Cup, U.S. coach Jill Ellis among those who sounded less than confident in her public comments that Press would find the necessary competition and training environment. To Press, it was an opportunity to be in control of her own life. Watching Swedes soak up the precious summer sun as she walked the cobblestoned streets of Gothenburg for a second time was, in her words, one of the strangest experiences of her life. The deja vu was so strong that she never did manage to stop calling teammate Savannah Levin by older sister Camille's first name -- Camille is a former Stanford teammate who also was on the Gøteborg FC roster during Press' first stay in Scandinavia. "It felt like it gave me what I needed, and I never thought I would need that again," Press said. "Time passes and your situation changes, and I really feel like I did need it again. I did need a break from my norm, a break from my routine. To oversimplify my first experience, that's what it was -- it was a distancing from the pressure I had felt and there was a little bit of relief just in that distance. This time it wasn't that I felt so much pressure -- it was like I just had to be free again." She weighed options beyond the end of her short-term contract in Sweden, including other options in Europe. 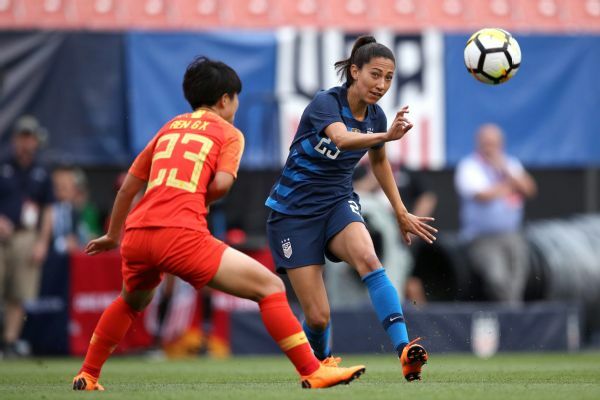 She said she had no inkling upon returning stateside to join the national team for a June 7 game in Salt Lake City that soccer would soon take her back to Utah. She met Dell Loy Hansen, owner of the NWSL's first-year Utah Royals FC, but after she came on as a substitute in Salt Lake City and started five days later in Cleveland, she boarded a plane back to Sweden. Less than a week later, the Royals acquired her NWSL rights in a trade. The infrastructure and amenities available with the Royals, operated in conjunction with Real Salt Lake of MLS, appealed to her. Quite literally, the physical space was a selling point. "Just that feeling when you come into work and you don't want to leave, where work is wonderful," Press said. "If instead of feeling trapped you feel like, 'Wow, I'm happy to be here,' that is huge for me. "It takes the mental effort out of it and then you can use that effort somewhere else." The physical space freed her to work on the mental space. Arguably no player in recent memory delves as deeply into that space. She is the Vasco da Gama of athletic introspection. Among what she describes is a sense of two selves. One self is governed by the moment, the self that reacts to everyday stimuli and, for example, feeds our thirst for social media's approval or arguments. The other self, the "true self" as she described it, is more permanent. 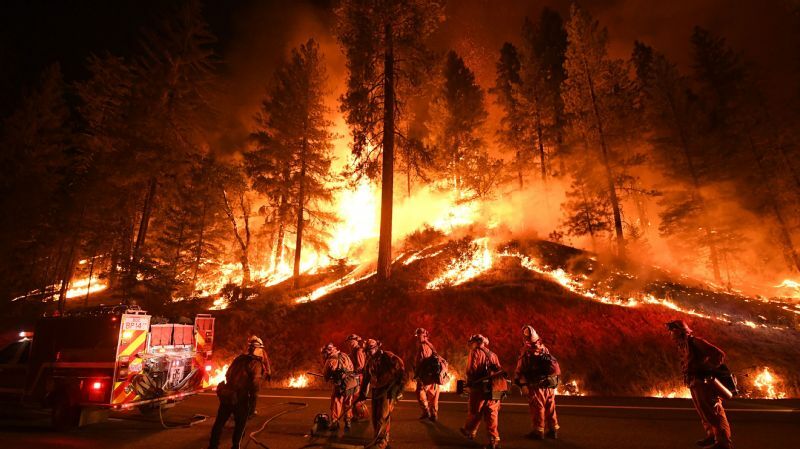 The feeling you get in the presence of some natural wonder, when everyday stresses suddenly seem trivial, is one small manifestation of that true self. Press tries to avoid lingering in the first reactive self. "That has been something that's been very hard for me to do in football because so much of football is outside validation," Press said. "It's your coach deciding if you're good enough to play; it's the world counting how many goals you score. It's a lot of outside validation that allows you to even have opportunities within the sport. ... Those are true experiences, those are real things that have consequences on my life. But not being attached to them, not attaching my identity and my validity to other things that I can't control, has really helped me start to love myself as a player and start to love myself as a person and gotten closer to that [permanent self]." It is inescapable that few players have more recent experience with the reality that outside validation goes hand in hand with outside rejection. Many things didn't go well for the U.S. in the 2016 Olympics, when the team missed the medal round for the first time. Press was far from foremost on that list, but she was the unlucky final entry. The shootout attempt from the spot that she missed in the quarterfinal against Sweden marked the end of the line for the Americans. Dealing with that disappointment wasn't a proactive exercise. There wasn't a book with answers or a plan to follow. Understanding and peace came retroactively. They came when enough time had passed that it became impossible to ignore that new mornings kept arriving. "When you then look at the future, you know that as much as [the miss] will always feel like such a big deal, because it is a big deal, the sun will still rise no matter what," Press said. "There's going to be a ton more failures in my future, but that doesn't mean my goals aren't achievable. "That's what it sometimes feels like; it feels like if you miss this penalty, you'll never be who you wanted to be. Or that history is set in stone, and once you've lost or failed, that defines you." It comes back to what is in some ways a perpetual conflict for Press. Someone whose life has been spent in the hyper-competitive world of elite sport -- someone who is by the measure of her achievements and longevity an intensely successful competitor -- she often sounds ill at ease with the agency over her own life that takes away from her. It is a fascinating juxtaposition. ... It feels like if you miss this penalty, you'll never be who you wanted to be. Or that history is set in stone, and once you've lost or failed, that defines you. "If I want to be the best player in the world, I've already in that sentence said that I need to be better than everybody else, and that's giving attention to everybody else," Press said. "That is kind of against some of my more fundamental beliefs about being a human and being happy and pursuing joy and contentment and gratitude and those things that are important to me. "It is a challenge learning how to live in this space while I'm trying to grow to be a certain type of person." 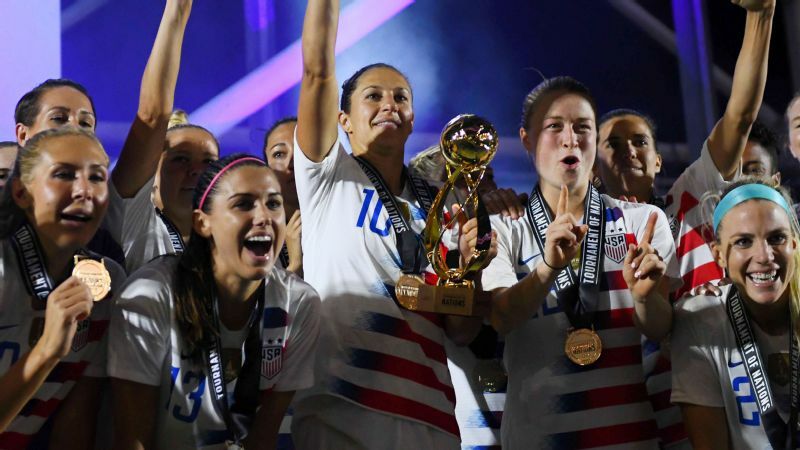 It is a challenge to imagine Michael Jordan -- or Carli Lloyd, for that matter -- entertaining that sort of deeply introspective inner monologue about the nature of identity and competition. But again, what 2018 offers her is the idea that complicated questions have simple answers. When she signed a contract to play in Sweden years ago, she cried for almost three weeks straight, overwhelmed by the enormity of what she was undertaking. This time she had barely a day's notice before she was sitting on a plane flying across the Atlantic Ocean. She was fine. There wasn't time to plan or analyze or ponder much of anything. She just went and adapted, then did it again upon returning to a new team and teammates in the NWSL. That all may be to the national team's benefit. On a U.S. team loaded with attacking talent, a team in which there is such a logjam of options at forward that Crystal Dunn ends up playing outside back, Press occupies a role best described as being ready to do more than ever before. To make herself indispensable on a World Cup roster, she needs to be able to spell Alex Morgan as the No. 9 and finish chances inside the box but also play in wide positions and deliver the ball into dangerous spaces. Someone with 44 international goals serving as that sort of Swiss Army Knife would be a luxury few other teams could match, even if none of the roles are a perfect match for her skills. "In a way I feel like it's just giving me tools so I can be a flexible player," Press said. "And as I have become a more veteran player on this team, often the veteran players kind of get put in a [box of] 'I know what this player is like.' I think in a strange coincidence, as I've gotten older I've actually become more versatile and my role on the team has become more flexible. "I think that's something this year has also forced upon me, but I'm embracing it." It isn't the year she expected. That doesn't mean she was wrong back in January.